Bungeeing, Throwing, Building, Scrambling, Challenging,Bouncing, Balancing, Jumping, Singing, Dancing, Splashing, Conquering, Testing, Skill and Judgement awaits you. Can your team beat the rest in the modern day version of the classic BBC TV spin off It’s a Knockout? 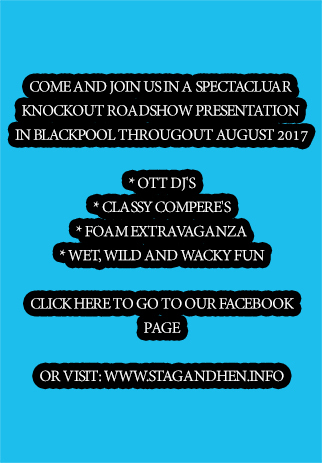 Knockout Roadshow is a mixture of race games and games that require skill and judgement at the end of the inflatable's to gain points. A fast moving game show with plenty of atmosphere in a safe controlled environment with BS standard equipment for all the family to enjoy. If we can, we set out our arena so even the audience can get close to the stage and see all the Inflatables were the action takes place. We believe Knockout Roadshow is one of the best It’s a Knockout’s operating today, with a modern twist using state of the art equipment. Below is how we can setup the arena in different configurations.